Join the analog film movement and help us keep celluloid film practice alive! Support the mission of preserving the knowledge and technology of motion-picture film by helping us expand our independent film laboratory and rescue FILM16’s unique lab equipment from liquidation. LaborBerlin is a collective of moving-image artists and enthusiasts who share a belief in the vitality of celluloid as an artistic medium. It embraces an experimental and D.I.Y. craft approach to film production with a mission to support the use of film outside of the commercial film industry. Over the last 10 years, LaborBerlin has offered an alternative to mainstream production for people who are driven to work with film, free from aesthetic and thematic restrictions. In our space, within a non-hierarchical structure, members can work hands-on with Super 8, 16mm and 35 mm film, developing, cutting, copying and experimenting freely with the material of film. By providing the laboratory, the materials and equipment for film-practitioners who otherwise would not be able to realize their vision, LaborBerlin is a valuable and critical resource within Berlin’s creative scene. However, for all our progress, LaborBerlin is still not completely self-sufficient. We lack the equipment necessary to be able to control the entire postproduction phase of analog filmmaking, from processing to making high quality prints. In order to secure film’s future it has always been our mission to offer our members and the entire artistic community the entire range of workflows of motion picture filmmaking, from the DIY to the industry standard and everything in between. Since this will mean a whole new incarnation of our lab and a giant leap towards complete independence we are calling our initiative LABORBERLIN 2.0. Right now, we have a once in a lifetime opportunity to purchase and integrate into LaborBerlin professional 16mm processing and printing machines from FILM16. FILM16 was one of the last remaining professional film labs in Germany. Sadly, three months ago they closed their doors. We need your support to afford the purchase, transportation and renovations associated with the installation of FILM16’s equipment into our new space in Berlin. If we succeed we will be rescuing unique, tailor-made, and irreplaceable film technology from ending up on the scrap-yard. Since the 1970’s, Helmut Rings, the owner of FILM16, has been engineering and modifying his machines to suit the needs of his one-man-lab. He has found solutions for the complex relationship between chemistry usage and energy consumption, temperature, agitation and processing speeds. These processing machines are exemplary in terms of solving the specific technical problems of small batch developing and exceed by far the standards of any industrial design in terms of size, efficiency and sustainability. This is a complete package, in very good condition, with each machine coming with its respective accessories and spare parts; all working in perfect harmony with one another. Specifically this package will allow our members to develop large quantities of color negative and black and white negative or positive film (600metres of film in just a couple of hours), make contact or optical prints of that material and create final, timed prints for projection. As part of this package, Mr. Rings is committed to helping us with the installation and maintenance of his machines and sharing his life-long experience and technical expertise in film processing. The total cost of the equipment package including taxes is 24 000 Euros. Transportation and renovation costs associated with installation of the equipment is 6000 Euros. The more support we receive, the more work we can do to achieve our vision of LaborBerlin 2.0. If we raise funds over and above our crowd-funding goal then our next priority will be to build and install an optical telecine machine so our members can transfer their films to a high quality 2K digital image. Over the last 10 years, the film industry has undertaken a radical shift. As digital technology has saturated the market, celluloid film – from day one synonymous with the 120-year old history of cinema – has been forced out and pushed underground. We believe in the co-existence of film and digital technologies, and in our responsibility in preserving the possibility of being able to choose between both mediums. As commercial film labs close, as cinemas stop screening film prints, as projection and processing equipment is being scrapped, and as film-technicians are put out of work – celluloid film is in crisis. At the same time, there is a global movement of filmmakers and artists who resist the digital monoculture and continue to use film for their work and actively speak out for the future of film. 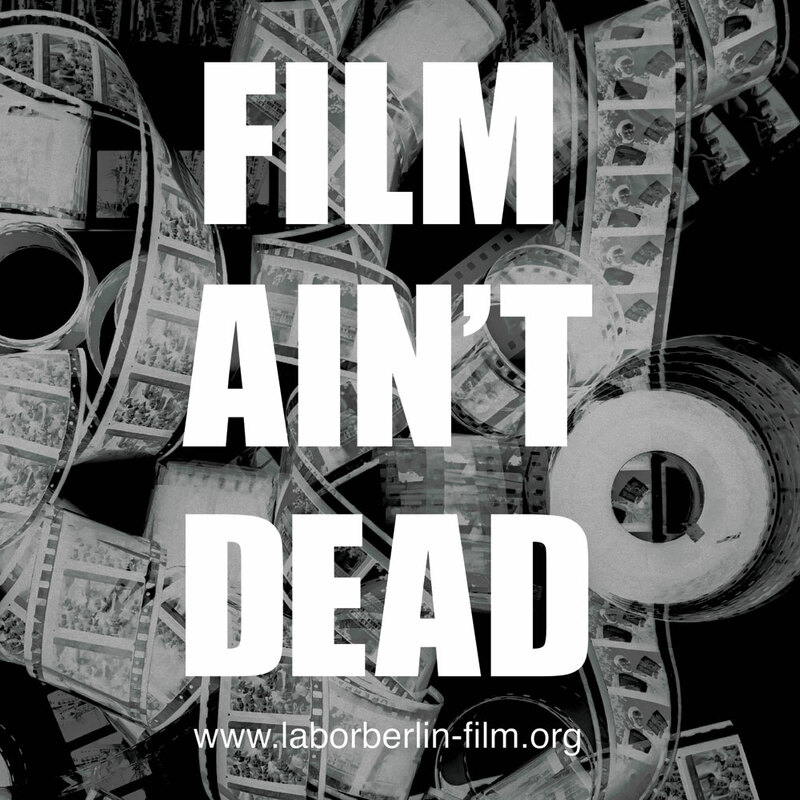 LaborBerlin is part of a worldwide network of self-organized film laboratories leading the mission to re-think and re-activate the medium of film. These organizations are restoring machines, preserving specialized knowledge and inventing new technical solutions, such as eco-friendly developing and homemade film emulsions. For our part, we strive to keep our membership costs at a minimum to ensure the lab is open to everyone and we regularly provide practical workshops, inviting artists from the world-over to share their skills and knowledge with us. We organize frequent screenings and exhibitions in co-operation with other filmmakers and institutions to share artistic and technical experiment, to provide a wider platform for our members’ works and to build broader creative networks. With your support, we will be able to do our part in keeping celluloid film a dynamic and viable medium and an integral part of cinema culture. This challenge is of interest to every filmmaker, media-historian, film critic and every person who understands the value in keeping cinema alive. If we lose this opportunity to protect a valuable part of cinema culture NOW, than we may lose far more than we can possibly imagine FOR THE FUTURE. Please share our campaign and talk to as many people as you can about it. If you have any ideas or information about people or institutions you think we should get in touch with, please don’t hesitate to email us. We are also grateful for any other kind of support you can donate. For instance, if you are an engineer, or an electrician, or a driver or any kind of skill or resource that may help, please get in touch with us! Everyday we will be active on the ground in Berlin talking about LaborBerlin 2.0, and during many events and festivals we will be campaigning to raise awareness about our campaign and everything we are trying to achieve. If you have time on your hands and would like to join us, please get in touch. We will also be holding events alongside the campaign, so please come along to our screenings and join us in making a racket for film! In any way that you can stand with us and shout FILM AIN’T DEAD!!!! Mach mit und werde Teil einer internationalen Bewegung, die die Arbeit mit analogem Film lebendig hält. Unterstütze uns dabei, das Wissen und die Technologie des bewegten Bildes auf Film zu erhalten, indem Du uns hilfst unser unabhängiges Filmlabor zu erweitern und die einzigartige Ausrüstung des Labors FILM16 vor seiner Verschrottung zu retten. Das Kollektiv LaborBerlin besteht aus Filmemacher_innen, Künstler_innen und Enthusiasten, die an die Lebendigkeit und Aktualität des analogen Films als künstlerisches Mittel glauben. Dies umfasst eine experimentelle wie handwerkliche DIY – Herangehensweise an die Filmproduktion, mit dem Ziel, eine Nutzung von Filmmaterial außerhalb der kommerziellen Filmindustrie möglich zu machen. Seit 10 Jahren bietet LaborBerlin eine Alternative zur Mainstream – Filmproduktion für alle, die frei von ästhetischen und thematischen Restriktionen mit analogem Filmmaterial arbeiten möchten. Die Mitglieder können praktisch und direkt mit Super 8, Normal 8, 16mm und 35mm Film arbeiten, das bedeutet: entwickeln, schneiden, kopieren und selbstständig mit Filmmaterial experimentieren. Indem der Verein ein Labor, Material sowie Werkzeuge bereitstellt, haben die Filmemacher_innen die Möglichkeit, ihre Visionen zu verwirklichen. LaborBerlin ist damit ein wertvolles und bereicherndes Element innerhalb der Kreativ-Szene von Berlin. Trotz aller Fortschritte ist LaborBerlin noch nicht in allen Prozessen der Postproduktion vollkommen unabhängig. Es fehlt uns noch an nötiger Ausrüstung, um jeden Schritt von der Entwicklung bis zur Erstellung einer hochwertigen Kopie unabhängig verwirklichen/realisieren zu können. Um eine Zukunft des analogen Films zu sichern, ist es schon immer unser erklärtes Ziel gewesen, unseren Mitgliedern und allen Interessierten die gesamte Bandbreite der Arbeit mit Film von einer DIY- Herangehensweise bis zum industriellen Standard zu bieten. Da die Verwirklichung dieses Ziels eine vollkommen neue Position des Labors und ein riesiger Schritt in Richtung vollkommener Unabhängigkeit sein wird, nennen wir unsere Initiative LaborBerlin 2.0. FILM16 war eines der letzten verbliebenen professionellen Labore in Deutschland. Leider musste es vor drei Monaten schließen. Wir haben jetzt die einmalige Gelegenheit professionelle 16mm Entwicklungs- und Kopiermaschinen von FILM16 zu erwerben. Wir brauchen Ihre/Deine Unterstützung, um die Renovierungsarbeiten in unserem neuen Labor, den Kauf und Transport, sowie Installationskosten des Equipments stemmen zu können. Wenn wir erfolgreich sind, haben wir einzigartige und unersetzliche Filmtechnologie, die genau in unser Labor passt, vor dem Schrottplatz bewahrt. Seit den 1970er Jahren hat Helmut Rings, Gründer von FILM16, seine Maschinen verbessert und modifiziert und den Bedürfnissen eines Ein-Mann-Labors angepasst. Er hat Lösungen für die komplexe Beziehung zwischen Chemienutzung und Energieverbrauch, Temperatur, Agitation und Entwicklungsschnelligkeit gefunden. Diese Entwicklungsmaschinen sind besonders geeignet kleine Mengen von Filmmaterial zu entwickeln und übertreffen in ihrer Effizienz und Nachhaltigkeit bei weitem die technischen Standards der Industrie. Dies ist ein komplettes Paket in einem sehr guten Zustand, in dem jede Maschine mit ihren dazugehörigen Kleinteilen und Ersatzstücken geliefert wird: gemeinsam arbeiten sie in perfekter Harmonie miteinander. Dieses Paket wird es unseren Mitgliedern möglich machen, eine große Menge an Farb-Negativ sowie Schwarz-weiß Negativ oder Positiv-Film zu entwickeln (600 Meter Film in nur einigen Stunden) und so Nullkopien oder lichtbestimmte Kopien für die Projektion zu erstellen. Teil des Pakets ist Herrn Rings Hilfe mit der Installation und der Wartung der Maschinen. Herr Rings ist bereit seine lebenslange Erfahrung und technische Expertise in der Filmentwicklung mit uns zu teilen. Die Kosten für das gesamte Equipment inklusive Steuern betragen 24.000 Euros. Transport und Renovierungskosten für die Installierung des Equipments betragen 6000 Euros. Je mehr Unterstützung wir bekommen, desto eher können wir unsere Vision von LaborBerlin 2.0 verwirklichen. Wenn wir mehr Geld einsammeln sollten als für die Crowdfunding-Kampagne festgesetzt, wäre unsere nächste Prioriät einen Abtaster zu bauen, mit dem Mitglieder Film in 2K Qualität digitalisieren können. In den letzten zehn Jahren hat die Filmindustrie eine radikale Veränderung durchgemacht. Sobald die digitale Technologie den Markt gesättigt hatte, war der Analog-Film – Synonym für die 120 Jahre alte Geschichte des Kinos – aus dem Markt und in den Untergrund gedrängt worden. Wir glauben an die Koexistenz von Analogfilm und digitalen Technologien und sehen es als unsere Verantwortung die Möglichkeit der Wahl zwischen beiden Medien zu erhalten. Die kommerziellen Filmlabore schließen, Kinos hören auf Filmkopien zu zeigen, Projektoren und Entwicklungsmaschinen landen auf dem Schrott, Filmtechniker verlieren ihre Jobs. Der Analogfilm befindet sich in einer Krise. Gleichzeitig gibt es eine globale Bewegung von Filmemacher_innen und Künstler_innen, die sich gegen die digitale Monokultur auflehnen und weiter mit Analogfilm arbeiten und sich aktiv für eine Zukunft des analogen Films einsetzen. LaborBerlin ist Teil eines weltweiten Netzwerks von selbstorganisierten Filmlaboren, die den analogen Film als Medium neu denken und zu neuem Leben erwecken. Die Labore restaurieren Maschinen, erhalten das Spezialwissen der analogen Technologien und erfinden neue technische Lösungen, wie z.B. ökologische Entwicklungsmethoden und selbstgemachte Filmbeschichtung. Wir versuchen die Kosten für eine Mitgliedschaft bei LaborBerlin auf dem Minimum zu halten, um sicherzustellen, dass jede/r mitmachen kann und wir bieten regelmäßig Workshops an, für die wir Künstler_innen aus aller Welt einladen, ihr Können und ihr Wissen mit uns zu teilen. Wir organisieren auch regelmäßige Filmvorführungen und Ausstellungen, für die wir mit anderen Filmemacher_innen und Institutionen kooperieren, um eine Plattform für die Arbeiten unserer Mitglieder und ein kreatives Netzwerk aufzubauen. Mit Ihrer/deiner Unterstützung können wir einen Beitrag leisten, um den Analogfilm als dynamisches und lebendiges Medium und integralen Bestandteil der Kinokultur zu erhalten. Diese Herausforderung ist für Filmemacher_innen wie Medienhistoriker oder Filmkritiker_innen und alle, die einen Wert darin sehen, Kino lebendig zu halten, gleichermaßen wichtig. Wenn wir JETZT die Gelegenheit vorübergehen lassen, einen wertvollen Teil der Kinokultur zu erhalten, dann wir verlieren wir IN DER ZUKUNFT viel mehr als wir uns zur Zeit vorstellen können. Bitte leiten Sie/leite unsere Kampagne weiter und erzähl so vielen Leuten wie möglich davon. Wenn du Ideen oder Informationen hast, z.B. über Menschen oder Institutionen, mit den wir in Kontakt treten sollten, teil uns das bitte gleich mit! Wir freuen uns auch über jede praktische Art von Unterstützung – z.B. wenn du Ingenieur, Elektriker oder Fahrer bist oder über andere nützliche Fertigkeiten verfügst und diese ein paar Stunden für uns einsetzen möchtest. Während der Kampagne werden wir jeden Tag in Berlin unterwegs sein, auf der Straße, bei Veranstaltungen und Festivals, um über unsere Ziele mit LaborBerlin 2.0 zu sprechen. Wenn du etwas Zeit hast und dabei sein möchtest, melde dich bei uns! Außerdem werden wir während der Kampagne einige Filmscreenings organisieren – sei dabei und hilf uns, die Trommel zu rühren für den analogen Film! Egal wie, sei dabei und unterstütze uns: FILM AIN’T DEAD!!! !